Noto, a UNESCO World Heritage site, is the capital of Sicilian baroque architecture. Its city centre is an extraordinary display of marvellous palaces decorated with typical flowery and lavish details, sinuous wrought-iron balconies and sumptuous churches. With its perfect urban organisation and luxurious buildings, the city is the most fascinating evidence of the most important and famous features of Sicilian baroque indeed. Please check out our Villas near Sicily Baroque Towns or our luxury villas in Sicily. 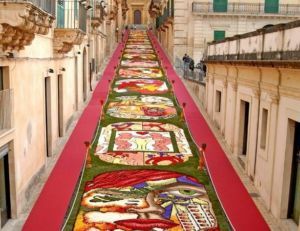 This is why it comes as no surprise to know that one of the most interesting and appealing events in southern Sicily takes place right here, in the historical centre of the capital of Baroque, and is actually about a superb, lavish display of the intriguing and resplendent beauty of flowers: the Infiorata di Noto is a flower festival to admire every year during the month of May, when the colours of spring are at their best. Since 1980 via Nicolaci, one of the most elegant streets of the city centre, is entirely decorated with flower compositions creating pictures, images and ornaments: every year the master florists participating to this stunning exhibit are given a topic on which they develop their colourful composition. 122 meters long, via Nicolaci is sided by some of the most refined palaces of the city, such as the world-famous palace of Prince Nicolaci “Villadorata”, whose willowy wrought-iron balconies are said to be the most beautiful in the world; the street ends right in front of the Church of Montevergini. An impressive number of visitors floods the two sides of the street to admire such a wonder: an extraordinary display of colours and shapes within one of the most enchanting settings you could ever imagine. So if you are spending your holidays in our Syracuse villas around May, don’t miss out!